Warm summer greetings to all! A number of client trade shows are getting our time and attention in June. These are ideal opportunities for us to get one-on-one, face-to-face time with important partners. We put a lot of thought, preparation and hardwork into these opportunities. Members of the team are headed to Idaho, New Jersey, Florida, and Ohio this month. We’ve opted out of SuperFloral again this summer, preferring to spend time and resources on established, strategic partnerships with agreed-upon goals and objectives. We’ve learned that this works better for clients, and we’re happy to be able to accommodate them. Heads Up, though: we are making plans to be at the Produce Marketing Association show in New Orleans in October. Robin has so much to share and display in Autumn, and we can’t wait to catch up with many of you there. I’m confident you’ll find that we’ve continued to improve and change in ways that benefit you. In the meantime, we are bursting at the seams with all the greatest flowers of the summer. The crops I’ve seen look outstanding, and Sunflowers are in ample supply. Sunbeams, Sun Splash, GreenBurst, and all the varieties with gorgeous dark centers are filling our coolers. 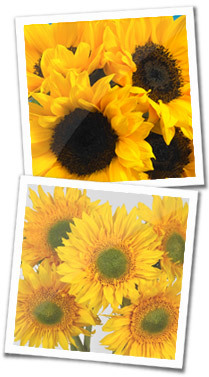 Might be time to think about a Sunflower Category vs a Sunflower Sku!? Dos Gringos has spread its wings a bit in recent months. I’m pleased to let you know that we’ve successfully purchased a 25 year old company, with over 5,000 clients called Pick On Us. This eco-friendly, sustainable concept produces cuisine décor – bamboo picks, stir sticks, and skewers – giving us improved access to unique and interesting bouquet picks. We’re excited to learn all we can and to share the possibilities with all of you. There’s a lot of synergy between how we sell flowers and how we sell these items, and I felt it was a great time to add some diversification to our business model and boost our financial position for the future. Aaron Motola, who many of you have known for years as DG’s procurement expert, has agreed to run Pick on Us for us. He and a small team have wasted no time getting up and into this marketplace. Conferences and trade shows throughout the spring have been invaluable in allowing us to connect with chefs and begin our quest to be the knowledge experts in cuisine décor – in the same way that we strive to be the smartest in flower and foliage in order to pass this education along to our clients. Check out the web site and see what we mean: www.pickonus.com. As spring gives way to summer this month, I hope terrific days are ahead for all of you. Together, let’s fill them with flowers!